Check in time from 8:00am – 8:45am. All competitions (Evening competition excepted) will commence at 9:00am and finish at 4:00pm. Lunch Break from 12:30pm till 1:15pm (may be amended to suit). A bottle of spirits for each winner. Raffle prizes will be gratefully received and faithfully applied. 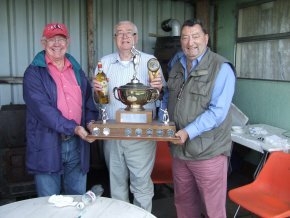 On Sunday 13 September 2015 the Provincial Grand Lodges of Ayrshire, Dumfries and Galloway held their Annual fishing competition at Jericho Loch, Dumfries. 6 of the Ayrshire Brethren went along to support it. However with only a few members we were lucky enough to win the competition. Individual winners were Bro. Frankie Twineham PPGM of Galloway. Well done Bro. Frankie many congratulations. 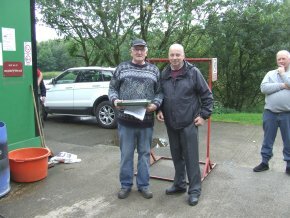 On Sunday 6 September 2015, PGLA held the Open Pairs Competition at Burns Fishery Tarbolton. 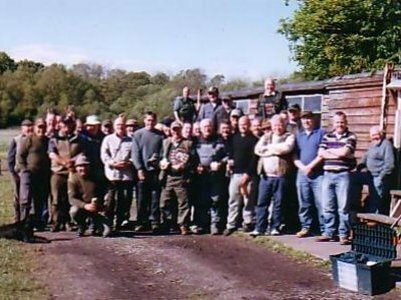 26 Brethren competed with 64 fish taken overall. 1st was Bro. 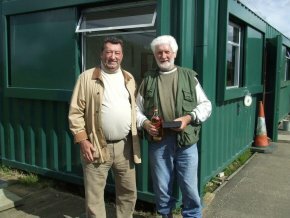 Bill Boe Lodge Dalry Blair No.290 and his partner Mr Joe Morrison. 2nd was Bro. John Anderson Lodge St John John No.11 and his partner grandson Mr Dylan Anderson. 3rd was Bro. David Kirk Lodge Mother Kilwinning No.0 and his partner Bro. John Wren Lodge Irvine Newtown No.1662. Our sincere thanks to Provincial Grand Office-bearer Bro. 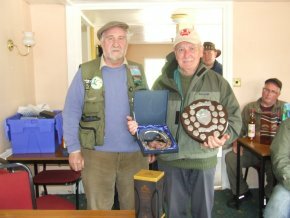 William Cuthbert for presenting the prizes, to all who provided raffle prizes throughout the season and to Burns Fishery for their hospitality. 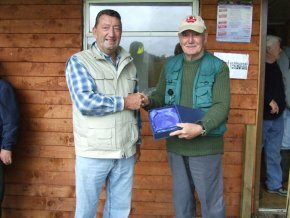 On Sunday 2 August 2015, PGLA held the Open Fly or Bait Fishing Competition at Burns Fishery,Tarbolton. 27 Brethren attended and 69 fish were taken. 1st place was Bro. Dave Penny RWM Lodge Royal Arch No.314. 2nd place was Bro. Craig Hamilton PM Lodge St. Andrew No.126. 3rd was Bro. Bill Boe Lodge Dalry Blair No.290 Our sincere thanks to the Provincial Grand Lodge of Kilwinning for their sponsorship, and to Provincial Grand Lodge of Kilwinning Office-bearer Bro. 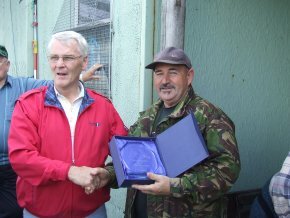 Robert McCrae for presenting the prizes and to the Burn Fishery for all their hospitality. 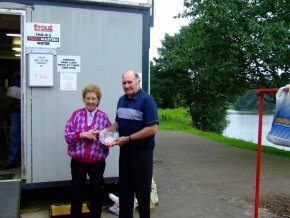 On Sunday 12 July 2015, PGLA held the Auld Codgers Fishing Competition at Burns Fishery, Tarbolton. The competition was well attended, and dedicated to the memory of Bro. Hugh Paton, Past Provincial Senior Warden. First on the fly was Bro. William McKee, Lodge Dalry Blair No. 290, and first on the bait was Bro. Campbell McKeller Lodge Mother Kilwinning No.0. 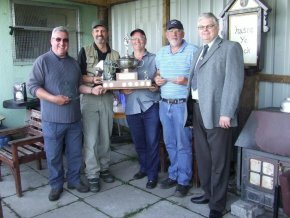 Thanks to Burns Fishery for hosting the competition, to our sponsors who wish to remain anonymous, and to Bro. David Strachan PPSGW. for presenting the prizes. 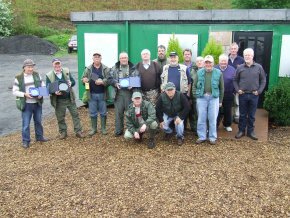 On Sunday 14 May the Annual PGLA Fly Fishing Competition was held at Burns Fishery Tarbolton where 27 Brethren and friends took part. The weather was not kind with a strong south west wind and heavy showers. Between the sunny spells, waterproofs were the order of the day. Owing to the adverse weather, instead of pegs, it was agreed to fish in two groups. One fishing the top of the loch and one at the bottom with change over after lunch. At 12.30pm the heavens opened, fortunately most were enjoying a bowl of Adam's wonderful stovies but the late comers were less fortunate. After lunch the extreme fishers went out and took advantage of a break in the weather. First to bag up was Bro. David Kirk followed by Bro. Craig Hamilton and Bro. Stewart Hamilton. 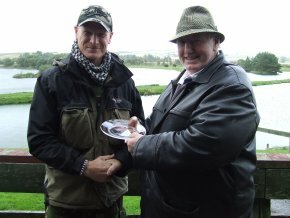 Although the weather was at times extreme, 61 fish were presented at the weigh in. The results were as follows 1st. Bro. Billy McDill PM 505 with 4 fish 8lbs 12oz, 2nd. Bro. Jack Heathcoat PM 125 with 4 fish 8lbs 2oz, 3rd. Bro. John Wren 1662 4 fish 7lbs 13oz. Heaviest Fish Bro. Billy McDill PM 505 3lbs 3oz. Best visitor Bro. David Frazer 1405 4 fish 8lbs 12oz. The competition was dedicated to the memory of our dearly departed Brother and fishing companion, Bro. David Murray PM St. John (Kil) Kilmarnock No.22. Our sincere thanks to all who attended and supported the competition and the Brethren who brought along raffle prizes. Special thanks to Bro. Stewart Hamilton who brought along a whisky bottle to toast Bro. Davie's memory. Thanks also to Substitute Provincial Grand Master Bro. Steven McConnachie for presenting the prizes. The competition was sponsored by Bro. Bill Dykes in memory of a dear friend and Brother David Murray. 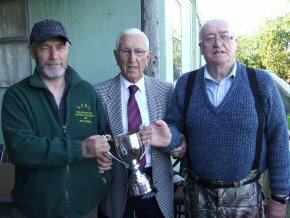 On Sunday the 7 of September at Burns Fishery Tarbolton, PGLA held the open pairs comp for the Robert Howitson challenge cup where 24 Brethren and friends competed for the honours. The weather was bright and sunny with a slight breeze and little cloud cover, nevertheless 64 fish were taken. First to bag up was Bro. Bill Boe and partner Mr Joe Morrison before lunch, after lunch Bro. Robert Cowan and Bro. Joe Savage while the rest of us struggled badly. During the competition we hade a wonderful view of two WW2 Lancaster boomers flying low over the Fishery. Our sincere thanks to Bro. Robert Howitson for sponsoring the competition and presenting the prizes. Thanks to all who donated raffle prizes and the boys at the Fishery Adam and Big Mike for their assistance and hospitality, the stovies were top notch. 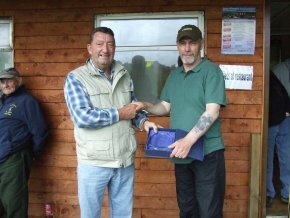 On Sunday 3 August PGLA held the open fly or bait competition at Burns Fishery Tarbolton. 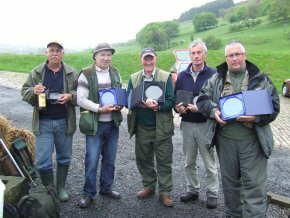 Despite the bad weather forecast 16 Brethren and 4 visitors fished for the honours. The rain came on just after 10am and did not abate until after 2pm. Although weather was terrible, the fish were still rising and being caught on the fly. Lunch was a pleasant respite after the heavy downpour and the stoves were devoured with relish, most with two helpings. It was good to have the crack with Bro. 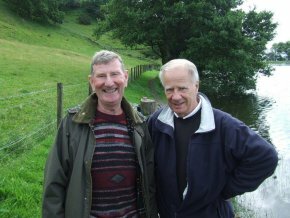 Bill Boe who's returned to the fishing after a recent illness and with Bro. 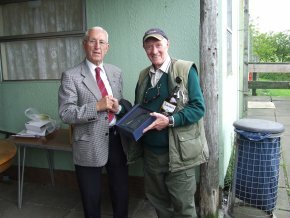 John Hodge who paid us a visit but could not fish owing to a sight impairment. We all wished him well and hope his sight returns soon. 39 fish were taken from the fly pond and 15 from bait ponds. RESULTS: 1st Bro. Bill Boe No.290 4 fish 10lbs 8 oz, 2nd Bro. Brian Bell No.505 4 fish 9lbs 7oz, 3rd Bro. Davie Kirk MK0 4 fish 8lbs 14oz. Best Visitor Mr Joe Morrison 4 Fish for 9lbs 1oz. HEAVIEST FISH went to Bro. Bill Boe 290, who appears not to have lost his touch, with a fish of 3lbs 11oz. Commiserations to Bro. 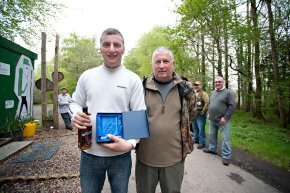 Tam Walker who lost out on heaviest fish by an ounce. Sincere thanks to our sponsors PGL Kilwinning and to the IPM Bro. David Bloomfield and the Substitute Grand Master of Ayrshire Bro. Sam Peden who presented the prizes. A big thanks to who supplied the raffles and to Adam and Mike of the Fishery for their hospitality and assistance. 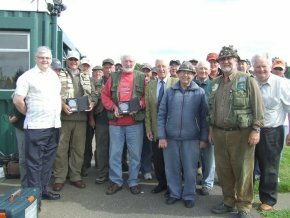 On 13 July,PGLA held the Auld Codgers fun day at Burns Fishery Tarbolton, where 19 Brethren fished for the honours and two guests who came along for a days fishing. 13 fished the fly and 8, the bait. 38 fish were taken in total 34 of which were off the fly pond. The bait boys hade a bad day with only 4 fish being taken from the bait ponds. The post fishing hospitality was taken in moderation. Our two newcomers to the competition, Bro. John Haynes and Bro. Jim Sergeant gave it a good go but no clear winner could be established. Results First on the bait Bro John Haynes 433 1 fish 2lbs 4oz now a bona fide auld codger. First on the fly Bro. Brian Bell 505 4 fish 9lbs 5oz. Our sincere thanks to Bro. 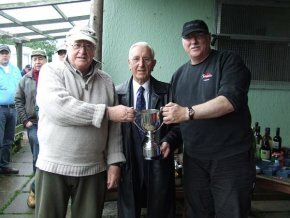 Bill Reid 1212 for sponsoring the competition and the lads at the fishery for their assistance. 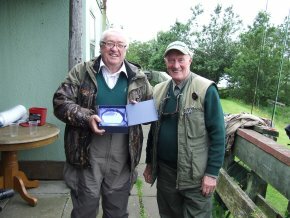 On the Sunday 18 May at Burns Fishery, Tarbolton, PGLA held their annual Fly Fishing competition. The weather was overcast with a strong wind blowing up the water making casting rather tricky. The fish were on the take, as Bro. Stuart Hamilton bagged up in 20 minutes, further to this Bro. Jim Watson, Bro. Davie Penny and visitors John Brown and Joe Morrison all bagged up before lunch. 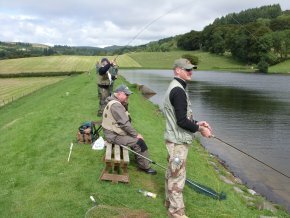 After lunch, Brian Bell, John Wren and Davie Kirk all bagged up, meanwhile Rob McCrae and Davie Murray were chasing their fourth fish. When Davie finally hooked up, unfortunately it broke him out but, that's fishing for you! With 9lbs 14oz in the bag it must have been disappointing. Results: 1st Bro. Davie Kirk IPM MK0 4 fish, 11lbs 12oz, 2nd Bro. Davie Penny WSW No.314 4 fish, 11lbs 11oz, 3rd Bro. John Wren No.1662 4 fish, 11lbs 3oz. Heaviest Fish: Bro Davie Kirk IPM MK0 4lbs 7oz. Best Visitor: Mr Joe Morrison 4 fish, 10lbs 12oz. Our best wishes go to Bro. 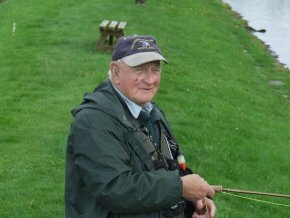 Bill Boe, who recently took ill while fishing Middle ton Fishery, Largs. Get well soon, we're all missing your banter. Our thanks to the boys at the fishery Mike and Adam for their assistance, and to Bro. Roddy McLean and Lodge Thistle No. 127 for their sponsorship. 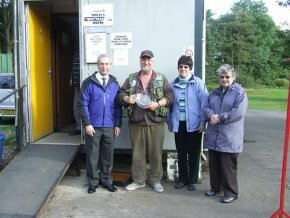 Also, our thanks to all who brought a raffle and to RWPGM Robert Little for his visit. 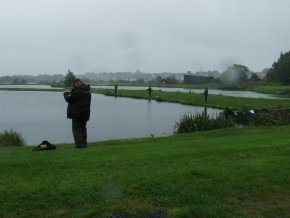 On 20 October PGLA hosted the inter Provincial Fly Fishing between Ayrshire and Dumfries and Galloway at Burns Fishery Tarbolton on one of the worst days weather of the year. 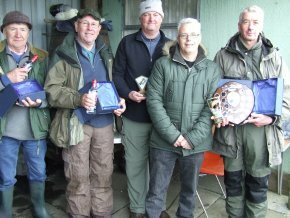 However the conditions did not deter nineteen fishers who braved the elements and fished the competition. Adverse weather did not seem to put the fish off. Bagged up before lunch were Tom Twinmam, Stuart Hamilton and Bill Boe. Lunch was a welcome break from the wind and rain. Piping hot stovies and a wee dram supplied by Bro. Duncan Fenwick PPSGW hit the spot. Thus fortified some of the Brethren set of to up their catch rate. Thanks to our RWPGM Bro. Robert Little who managed to duck the rain and gave us a flying visit. Thanks to Bro. 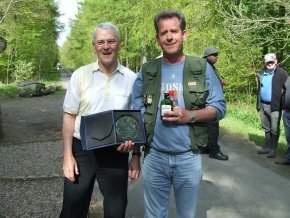 Duncan Fenwick PSPGW for presenting the prizes and his bottle of cheer which was polished of at the weigh in. Thanks also to Adam and Mike of the fishery for their assistance and hospitality. 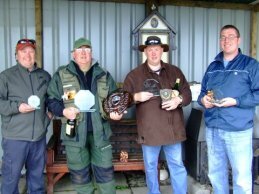 Results - 1st Ayrshire Provincial 30 fish 65lbs, Overall heaviest bag 1st Bro. Stewart Hamilton Ayrshire, 2nd Bro. 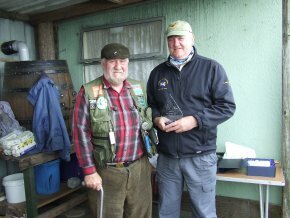 Tom Twinman Galloway, 2nd Galloway Provincial 13 fish 27lbs15oz, 3rd Bro. Davie Black. Heaviest fish Bro. John Wren Ayrshire. 3rd Dumfries Provincial 7 fish 14lbs 2oz. 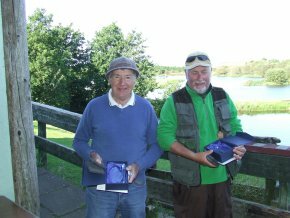 On Sunday 1 September at Burns Fishery Tarbolton the PGL Ayrshire held their open pairs competition where 30 Brethren and friends competed for the Robert Howitson Challenge Cup. 77 fish were taken for 158lbs 5oz the weather was bright and breezy, not ideal fishing conditions. The first pair to bag up before lunch were Bro. John Carroll and Mr Dougie Ingles. After lunch Bro. Bill Boe and Bro. Eddie Dunlop left the rest playing catchup but Bro. 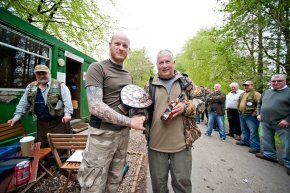 Tam Stewart in the dying seconds of the competition hooked and landed his forth fish much to the relief of his partner Bro. John Hodge who had bagged up a couple of hours earlier. 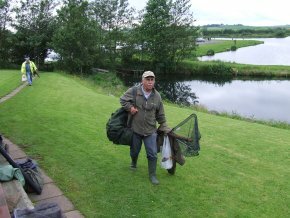 With only ten full bags coming off the fly pond and one of the bait pond the competition was wide open. The weigh in would see some disappointed partnerships. Better luck next year boys. Results: 1st Bro. John Hodge No11, 1st Bro. Tam Stewart No.22 8 fish 21lbs 1oz, 2nd Bro. 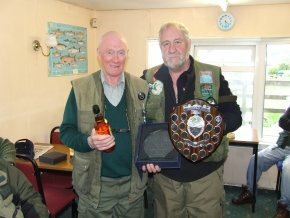 John Carroll No 126, 2nd Mr Dougie Inglis 8 fish 18lbs 5oz, 3rd Bro. Bill Boe No.290, 3rd Bro. Eddie Dunlop No.290 8 fish 17lbs 6oz, Heaviest fish Bro Craig Hamilton No.126. Our sincere and grateful thanks to Bro. Bobby Howitson who sponsored the Competition. It was greatly appreciated. Our thanks to the boy's at the fishery, Adam and Mike for their assistance and hospitality, the stovies were brilliant and to all who brought raffles. 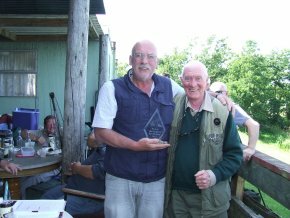 On Sunday 4 of August PGLA held their annual fly or bait competition at Burns Fishery Tarbolton where 27 Brethren and friends fished for the honours. 58 fish were taken for 119lbs 3oz. The weather was fine but a bit on the bright side, the fishing would be hard and it was with only 5 full bags, all taking on the fly.The fishing Gods looked down on Bro. David Strachan who bagged up just before lunch with 3 good Rainbows and a very good Tiger trout of 3lbs 15oz which was very rare. Bro. Davie reckoned that he was in the right place at the right time. However on the other side of the spectrum Bro. Allan Fowler on the bait pond with 3 rainbows hoping for his fourth helped a young lad new to fishing how to tackle up and present his bait. His advice must have worked. The young lad hooked and landed a 9 pounder. Our sincere thanks to our sponsor, PGL Kilwinning and their Provincial Grand Secretary Bro. 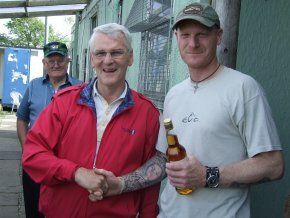 Andrew Campbell who presented the prizes to the lads at the Fishery for their Hospitality and to all who brought along raffle prizes. Results 1st Bro. David Strachan No.505 with 4 fish at 10lbs 10oz, 2nd Bro. John Anderson No.11 with 4 fish at 8lbs 6oz, 3rd Bro. John Benson No.442 with 4 fish at 7lbs 15oz. Heaviest fish Bro. David Strachan No.505 3lbs 15oz. Best Visitor Mr John Brown with 4 fish at 8lbs 3oz. 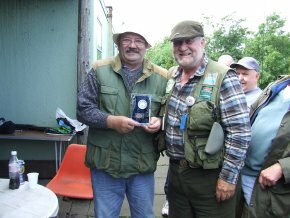 On Sunday 14 July at Burns Fishery Tarbolton PGL Ayrshire held their Auld Codgers fun day where 22 brethren competed for the honours, the weather was good with a wee bit of cloud cover. First to bag up was Bro. John Benson followed by Bro. John Wren, Bill Boe and Bill Dykes all before lunch. Lunch was stovies courtesy of the Fishery and Bro. Allan Flower supplied hard boiled duck eggs and curry and korma pieces washed down with his home made wine. The general conversation was the lack of fish coming of the bait pond, two well known Brethren of the Mother Lodge who normally fish the fly decided to have a go at the bait and had purchased some rather expensive lob worms. The eels liked them. Time to start apre's fishing. After lunch Bro. John Hodge, John Anderson, Stewart Hamilton and Brain Bell bagged up. 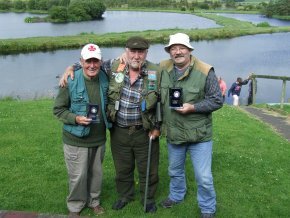 The apre's fishing was missing Bro David Murray so nobody won the apre's fishing who due to a shoulder operation could not attend. 48 Fishers were weighted in for 96lbs.12oz. Thanks to Adam and big Mick for their hospitality the stovies were brilliant and Bro. Bill Reid of 1212 for the sponsoring the competition and APGSW Bro. David Strachan for presenting the prizes sponsored by Bro. Bill Reid 1212. 1st on the Fly Bro John Wren 1662 4 Fish 10lbs 2oz, 1st on the Bait Bro. Allan Fowler MK0 3 Fish 5lbs 14oz. Total Fish taken 46 Fish for 90lbs 12oz. 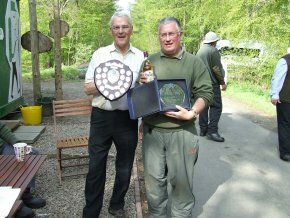 On Sunday the 19 May 2013 PGLA held their Annual Fly Fishing competition at Craufurdland Fishery, Fenwick where 30 Brethren and visitors competed for the honours. The weather was ideal for fishing, over cast with a slight breeze and some fish were showing on the top. Bro. Alan Murray was the first to hook up with a big blue over 5lbs, unfortunately Alan never touched another fish all day - “tough luck Alan you were a contender”. First to bag up was Bro. Stewart Hamilton with 4 fish for 12lbs 5oz. Lunch time saw many of the Brethren fishless, the lucky ones had one or two, even Bro. Bill Boe was struggling. After lunch the fish started to show on the top but were picky. At the weigh in only three Brethren with full bags and 4 brethren with 3 fish. Hard fishing indeed!!!!! Our thanks to RWM Bro. David Kirk of the Mother Lodge for sponsoring the competition and presenting of the prizes. To Bro. Stewart Hamilton for selling the raffle tickets, Bro. Rodger Harman for taking the photos, to all those who brought raffles and lastly to RWPGM Bro. Robert Little who paid us a flying visit. 1st Bro. Stewart Hamilton 126 - 4 fish for 12lbs 5oz, 2nd Bro. Brian Bell 505 - 4 fish for 9lbs 2 oz, 3rd Bro. Jim Watson 135 - 3 fish for 7lbs 17oz, heaviest fish Bro. Alan Murray 331 - 1 fish for 5lbs 5oz, best visitor Bro. Eddy Cowan 557 - 2 fish 3lbs 7oz. On Tuesday 27 Nov 2012 at the AGM of Provincial Grand Lodge Of Glasgow, Bro. 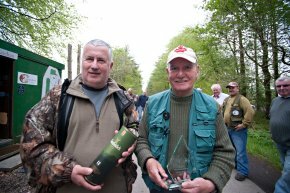 Billy Boe Of Lodge Dalry Blair No.290 was presented with a trophy and a bottle of Royal Salute 21 year old whisky to mark having won the guest fishing trophy for the third year in a row. It is fished over five outings throughout the year. The presentation was made by the RWPGM Bro. Alistair Henderson to mark his remarkable achievement. Bro. Billy has competed in the PGLA competition where he has also achieved success over the years. 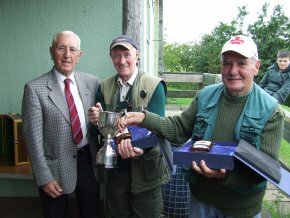 On Sunday 2 September 2012 PGLA held its annual open pairs competition for the Robert Howitson challenge cup. 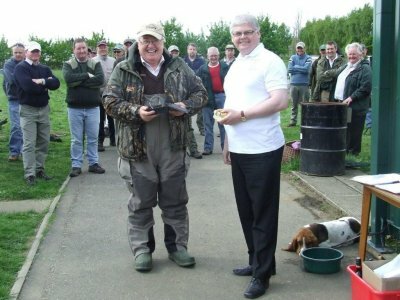 28 Brethren and friends turned up to fish for the honours. The weather was fair with a light breeze. At 9am we set off with high hopes, 22 on fly 6 on bait. First to bag up was Mr Doug Ingles in 1 hour 35 min with 5 fish for 10lbs 13oz, next was Bro. Bill Boe in 1hour 50min, 5 fish 14lbs both on the fly, leaving their partners and the rest of us to play catchup.The fishery we set out to try again. The competition was wide open with no pairs partnership being bagged up. The news from the bait pond was they were struggling as well. All in all it was a good day, and it was nice to see all the masons and non-masons, fathers and sons, and grandfathers and grandsons fish together. At the weigh in 75 fish were weighed in and the results are as follows - 1st Bro. John Carrol 126 and Mr Doug Ingles Total weight - 23lbs 5oz, 2nd Bro. Jim Watson 135 and Mr John Logan Total weight - 20lbs 2oz. 3rd Bro. David Strachan 505 and Brian Bell 505 Total weight - 19lbs 9oz Heaviest fish - Bro. Bill Boe 290 Weight - 4lbs 11oz. Our sincere thanks to our sponsor Bro. Bobby Howitson who came along and presented the prizes and Past Provincial Grand Senior Warden Bro. David Strachan who also assisted in presenting the prizes. To all Brethren who attend and those who brought along raffles to make the day a success, we thank you for the support. Also, a thanks to the boys at Burns' Fishery, Adam, Francy and Big Michael for their assistance. 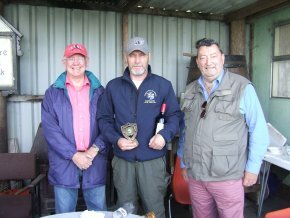 Sunday 8 July, PGLA held their annual Auld Codgers Fun day at Burns Fishery Tarbolton sponsored by Reid's Trophies purveyors of fine Masonic memorabilia. 26 Brethren and two guests, 9 on the bait 19 on the fly, Weather conditions looked perfect, overcast with a light breeze, however someone forgot to tell the fish. Lunchtime arrived with 3 Brethren on the fly with 3 fish each, Bro. Bill Boe, Bro Sanny Gilmour and Bro Alex Richmond, 2 on the bait with 1 fish each Bro. Tam Stewart and Bro. Rab Cowan. Lunch was once again a splendid affair with stovies supplied by the fishery, home made wine and hard boiled duck eggs supplied by Bro. Allan Fowler. 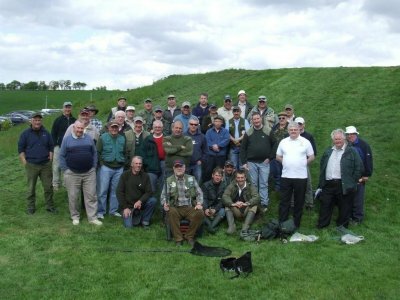 Thus fortified by a good lunch and a stiff drink some of the Brethren set forth to up their catch while others remained to start the apre fishing competition, this was going to be tough with a number of contenders after Bro. David Murray's crown. After a hard fought contest Bro. David relinquished his crown to Bro. John Hodge. 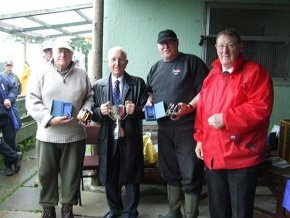 25 fish were weighed in at the end of the competition which saw Bro. Bill Boe once again victorious on the fly. First on Fly Bro. Bill Boe Lodge No.290, 5 Fish 11lbs 10oz. First on Bait Bro. Tam Stewart Lodge No. 22, 2 Fish 4lbs 0oz. Our thanks to RWPGM Bro Archie Chalmers who came along and gave the boys some words of encouragement and had some lunch before leaving for another engagement, to Bro. David Strachan PPG. 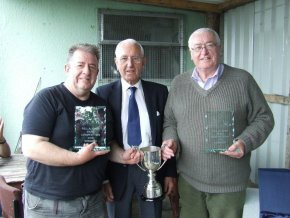 who presented the trophies and Reid's Trophies for their sponsorship, Adam, Francie and big Michael the lads of Burns Fishery for their hospitality. 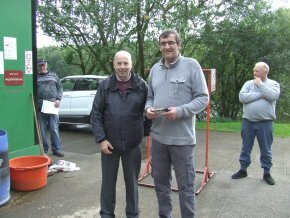 On 5 August PGLA held their Annual Fly or Bait competition sponsored by PGL Kilwinning at Coil Fishery near Coylton where 21 Brethren and 1 visitor fished for the honours. The weather was fine the setting was Idyllic with high hopes of a good catch as both ponds stocked the previous Saturday giving the fish time to settle in. Bro Bill Boe bagged up in 37 minutes. 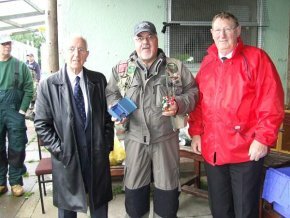 Three in a row first to bag up at the Fly Competition, first to bag up at the Auld Codgers and first at the Fly or Bait. After Bro. Bill's Master Class the rest tried to play catchup to no avail some reckon he put a hex on the fishing some said he was jammy. Bro. Bill put it down to skill and offered to give us some lessons on how to induce a take. Lunch was extended due to a cloud burst witch lasted a good 40 minutes. The bait pond seemed to be fishing better than the fly pond. Bro. Joe Savage had 3 and lost 2 before lunch and Bro. Campbell McKellor was stuck on 2 and lost 2. 25 fish weighed and the result was 1st Bro. Joe Savage MK0, 4 fish 8lbs 8oz, 2nd Bro. Bill Boe No.290, 4 fish 7lbs 12oz, 3rd Bro. Brian Bell No.505 3 fish 4lbs 14oz. Heaviest fish Bro. Bill Boe 2lbs 14oz. Best Visitor Mr John Morrison 1 fish 2lbs 13oz. Our sincere thanks to the PGL Kilwinning for their sponsorship and RWPGM.Bro David Bloomfield for his kind words and presenting the prizes, to RWPGM Bro. Archie for attending and to all who brought along raffles they were much appreciated. 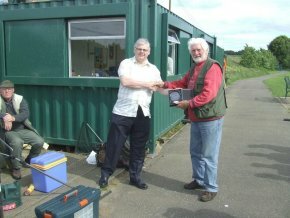 On the 20 May 2012, The PGL Ayrshire held their annual fishing competition at Craufurdland Fishery, Fenwick. 34 Brethren attended and 72 fish were taken. First to bag up was Bro Bill Boe within the hour, who was closely followed by Bro John Carroll who after weighing in went home for a kip. Intermediate lines were the order of the day as the sun had his hat on. However it was bright, but the wind changed direction every three quarters of an hour. Some fish were moving on the top of the water just to let you know they were there, with the brownies cruising round the margins. To the annoyance of all, only one brownie was caught by Bro Jim Cook No. 149, which was his only fish of the day. Our thanks to Craufurdland Fishery for their hospitality. Special thanks to Bro David Murray who sponsored the liquid prizes to go with the trophies and to all who brought raffles. 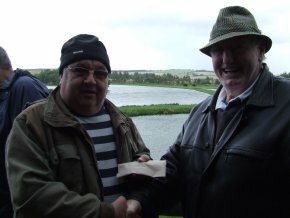 The Open Pairs Fly or Bait competition was held at Burns Fishery on Sunday 4 Sept 2011. 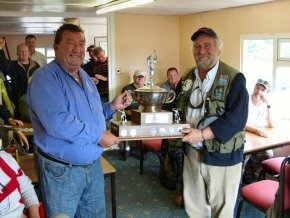 34 Brethren and Friends fished for the Robert Howitson challenge cup with 9 on the bait, 25 on the fly. First to bag up was Bro. David Murray at 10.40am followed by Bro. David Strachan at 11.25am, the only two Brethren to bag up before lunch and for their sins they got the privilege of selling the raffle tickets. Lunch was off the usual high standard, stovies and soup with crusty bread, our thanks to Adam, Francie and big Mike for their hospitality. 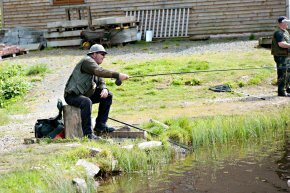 The fishing slowed right down after lunch with few fish being taken as the clock ticked down to the weigh in. Some became desperate men trying all types of fly combos to no avail, sorry partner we'll get them next year. 93 fish presented at the weigh in and the results were: First - Bro David Strachan PM 505 and Bro Brian Bell 505, Second - Bro John Hodge PM No11 and Bro David Murray PM No 22, Third - Steve Lynn No 149 and Mr Jim Gorman. The heaviest fish went to Bro David Strachan PM No. 505. Our congratulations to Bro David who is the first brother to win 3 of the 4 competitions,our sincere thanks to Brother Bobby Howitson for sponsoring the competition and presenting the prizes, the Brethren greatly appreciate your support. 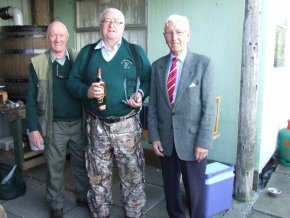 On Tuesday evening 22 November 2011 at the Installation of the Office-bearers of the Provincial Grand Lodge of Glasgow, Brother William Boe of Lodge Dalry Blair No.290, was presented with a winners fishing trophy of a bronze angler and a bottle of Scotch, for being the best visiting angler. 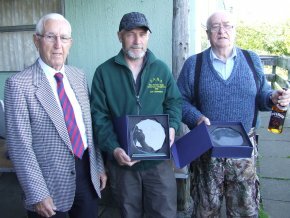 The competition was fished over five legs through the fishing season. This was the second year in a row, that Bro. Billy has won this competition. The presentation was made by the Right Worshipful Provincial Grand Master of Glasgow Brother Alistair Henderson. 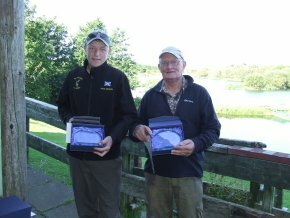 The fly or bait competition was held at Middleton Fishery Largs on Sunday the 7 of August 2011. 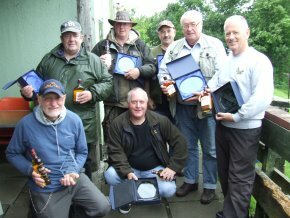 24 brethren fished for the honours but it rained and better rained. 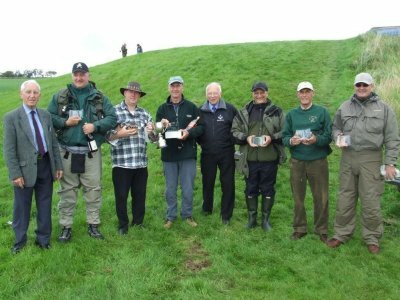 The competitors were soaked through before lunch so early lunches were the order of the day .The rain put the fish off anyway according to some quarters. First bagged up were Bro. David Murray and Bro. David Strachan before lunch with Bro. John Anderson and Rab Cowan after lunch. Our sincere thanks to PGL Kilwinning for their sponsorship and RWPGM Bro. David Bloomfield who presented the prizes and RWPGM Bro Archie Chalmers who came along and supported us. Our thanks to Middleton Fishery for the hospitality. First on Fly Bro. 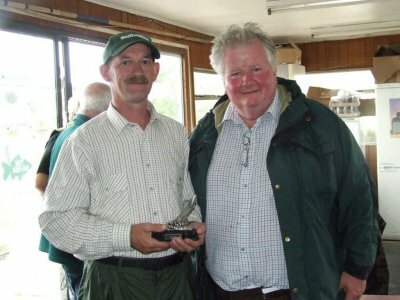 David Strachan No.505 Secy, on Fly Bro John Anderson No 11, 3rd on Bait Bro Rab Cowan MK0, Heaviest Fish Bro. Jim McClymont No.125. Best visitor Mr George Brown. 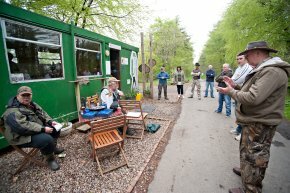 The Auld Codgers Fly or Bait fun day held at Burns Fishery Tarbolton on Sunday 10 July 2011. 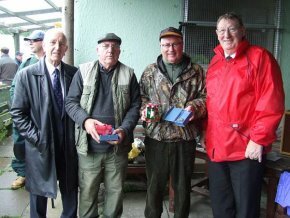 32 Brethren fished for the honour of becoming a bona fide Auld Codger. Fishing started at 9am with a stiff south westerly breeze and the threat of rain the rain came in about 1030am and went off at lunch, however lunch was a splendid affair with stovies supplied by the fishery, curry pieces and hard boiled duck eggs supply ed by Bro. Allan Fowler washed down with his home made wine it went down a treat and was greatly appreciated. 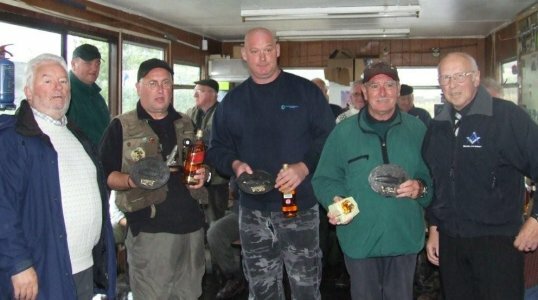 Thus fortified some of the Brethren set off to up their catch rate while some remained to do battle for the apres fishing crown which was won by bro David Murray followed by a very close second bro John Hodge.The winners and now bona fide Auld Codgers are: First on Fly Bro Bill Boe No 290, 5 Fish 10lbs 12oz, First on Bait, Bro. Tam Stewart No 22, 4 Fish 8lbs 9oz. The heaviest bag went to Bro. 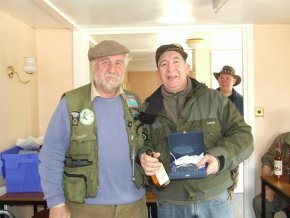 Stuart Hamilton No 126, 5 fish 12lbs 14oz but not being an auld codger he did not qualify however we took pity on him and he received a bottle of the hard stuff donated by Bro. Richard Allan. Our thanks to Bro. Sandy Gilmour for arranging sponsorship and the lads at Burns Fishery, Adam Francie and big Mike for their hospitality .A great day was had by all. 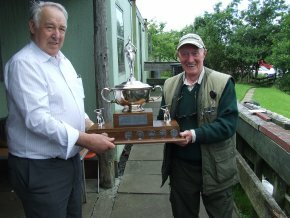 The PGLA Fishing Competition was held at Middleton Fishery in Largs on Sunday 15 May. 22 Brethren and friends took part on a wet and breezy morning. It dried up after lunch and 42 fish were caught. The winners were, 1st Bro. David Strachan PM 505 with 4 fish totalling 9lbs; 2nd Bro. David Kirk DM MK0 with 4 fish totalling 8lbs 12oz; 3rd Bro. John Wren 1662, 4 fish totalling 8lbs 11oz. The heaviest fish went to Bro. Alex Richmond 230, 3lbs and the best visitor Mr George Brown 2 fish totalling 4lbs 9oz. On Sunday 12th September 2010, PGLA. ran the Open Pairs Fly or Bait Competition. 28 Brethren and friends competed and 89 fish were landed. Our thanks to Burns Fishery for their hospitality and to our sponsor Bro. 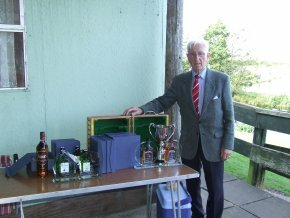 Bobby Howatson, who came along and presented the trophies. 1st : Bro. Bill Boe No.290 & Bro. Eddy Dunlop No.290 10 fish = 18lbs. 2nd : Bro. Sandy Gilmour No.1060 & Bro. Stewart Hamilton No.126 On Fly 8 fish = 17lbs 6oz. 3rd: Bro. Joe Savage No.0 & Bro. Campbell McKellar No.0 On Bait 9 fish = 16lbs 14oz. Heaviest Fish : Mr. John Brown On Fly = 3lbs 15oz. 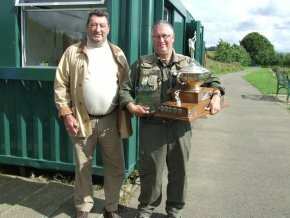 On Sunday 1 August, the PGLA held The Open Fly or Bait Competition. The weather was fair and not to bright and fish were rising. 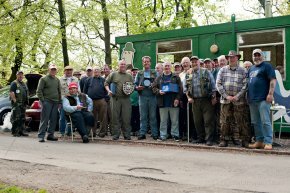 24 Brethren fished for the honours, 5 on Bait, 19 on Fly. 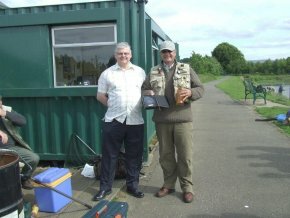 First to bag up was Bro Bill Boe followed by Bro David Murray both on fly, then Bro Richard Allan on Bait. As lunch approached Bro Davie McKie hooked into a large blue that gave him a good scrap. He managed to land it, and heading to get it weighed, with the hope of taking the heaviest fish, it came in at 3lbs 14oz. 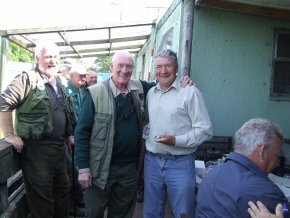 However while Bro Davie was at the weigh-in, Bro Brian Bell hooked into his 3rd fish, a cracking brownie, which was estimated to be a good 6lbs or more. Alas while lifting it out of the net for pictures, it became camera shy and it jumped out of hand. We went for lunch, to break the good news which was met by various comments. After lunch the fishing was slow. Fish were rising, but no one could suss out what they were rising to. Tactics had to be varied. Bro Dykes had opted for a Migetip Line with a size 14 olive cruncher on the point and a size 14 olive cruncher on the dropper. That’s when his luck changed. A big rainbow took hold of the dropper and the fight was on. One peg up Bro Brian Bell hooked into a feisty rainbow which headed towards Bro Dykes while his fish headed towards Bro Bell. 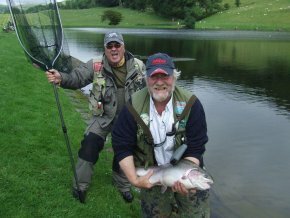 To avoid disaster Brian ducked under, thus avoiding a tangle and both fish were landed safely, with a big thanks to Bro Davie Murray, who netted fish which turned out to be a 14lbs Rainbow. Thanks to Bro Alistair McCray who revived the fish to fight another day. 54 fish were caught. 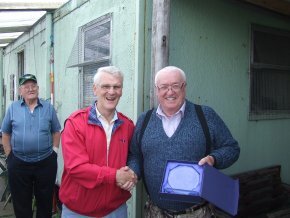 Our thanks to Middleton Fishery for their hospitality and to PGL of Kilwinning for their sponsorship, RWPGM Bro David Bloomfield for presenting the prize and to RWPGM Bro Archie Chalmers for his support and words of encouragement and to all the Brethren who brought raffle prizes. The Competition made £197 for the PGM charity funds. 1st Bro William Dykes PM No.1334 PGL BB, 2nd Bro Brian Bell No.505, 3rd Bro John Anderson No.11. Best Visitor - Mr John Brown. Heaviest Fish - Bro William Dykes PM No.1334. 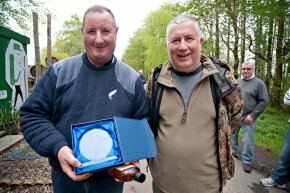 On the 16 May the PGLA held it's Annual Fly Fishing Competition at Middleton Fishery, Largs. 22 Brethren fished and 67 fish were caught. The weather was ideal and the fish were on the take. Some of the Brethren were bagged up before 11am and some of us struggled. Bro Jim Watson 135 took 4 fish then on catch and release landed a cracker of 14 lbs which was released safely. Unfortunately being his 5th fish it did not count. Tuff tattie Jim, better luck next time. Bro John Hodge No 11 also took four fish and then on catch and release hooked into a big fish which took him to the backing and broke him out. But the older Brethren's patience and perseverance pulled off to win the day. 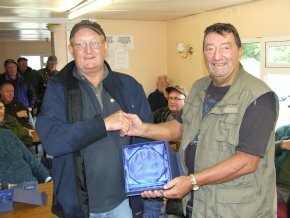 Bro Brian Bell No.505, a spritely 76 year old took 1st with heaviest bag. 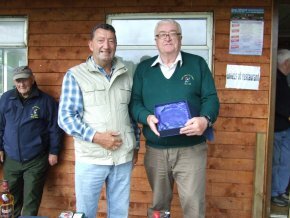 Bro David 'Roaster' McKie No 135, 82 years young took second with young gun Terry Burns No 149, a mere 50 years of age in 3rd place. Heaviest Fish went to Bro Robert McCrae PM No 0. 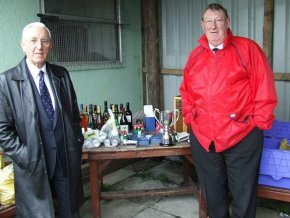 Many thanks to our sponsors Bro Joseph Baird and Bro Sandy Gilmour and to all who brought along raffle prizes. And also to all the Brethren who attended on the day our sincerest thanks. 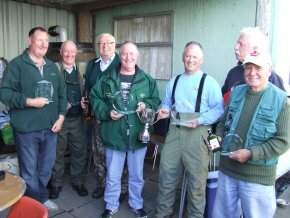 On 20 September, 12 Ayrshire Brethren went down to Dumfries to compete in the Inter Provincial fly fishing competition held at Jericho Loch Locharbriggs.They went to fish against Dumfries Provincial and Galloway Provincial Brethren. 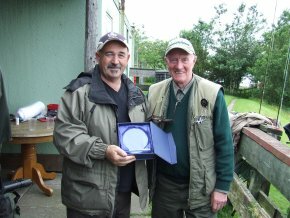 The weather, the fishing and the banter were all good and Ayrshire came away with the trophy. Our thanks to the PGL of Galloway for running the competition and PPGM Bro. Frank Twiname for the Galloway pies and sausage rolls which went down a treat. Our thanks must also go to the RWPGM of Dumfries Bro Brian Porteous and his good lady Ella and Mrs Sandra McMillan who presented the Prizes. 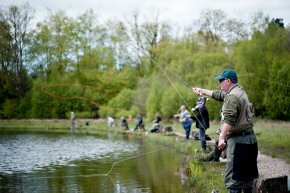 As it is Ayrshire's turn to host it next year we look forward fishing with our Brethren from Dumfries and Galloway Provincial. 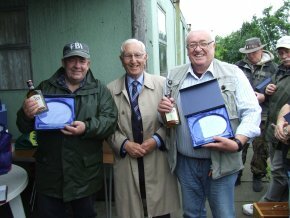 On 2 August 2009 The Provincial Grand Lodge of Ayrshire held the fly or bait competition at Burns Fishery, Tarbolton. 24 brethren fished, 32 fish were caught, 14 Brethren fished in the fly and 10 Brethren fished on the bait. 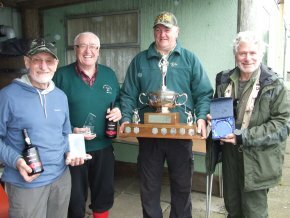 Once again the weather was against us with a strong wind blowing across the fishery, the fishing was really hard for both fly and bait fishers, however the bait fishers won through and took the trophy. 1st overall on bait Bro. Richard Allan MK0 5 fish 8lbs 2ozs, 2nd on bait Bro. Alan Fowler MK0 5 fish 7lbs 12ozs, 3rd on fly Bro. Jack Heathcote St James No 125 2 fish 5lbs 10ozs, Heaviest fish Bro. Jim Murray on fly St Peter No 331 3lbs 6ozs, Best visitor Bro. John Bryce on fly No 1425 2lb 8ozs.Our sincere thanks go to the Provincial Grand Lodge of Kilwinning for their sponsorship and their Depute Provincial Grand Master Bro. Tom Woods for presenting the prizes and to our Provincial Grand Master for assisting. All the Brethren for bringing along all the raffle prizes and Burns Fishery for the excellent lunch. 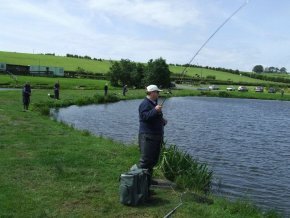 On Sunday 12 July, we held the Old Codgers Fun day Fly or bait at the Burns Fishery at Tarbolton, 28 brethren fished and 36 fish were caught. Fishing conditions were pretty good with a light breeze and drizzly rain, however no one told the fish and they were slow to come on the take, so much so Bro. Hugh Paton went into the bait pond after them!!! Help was close at hand and Bro. Hugh was extracted from his predicament much to everyone's relief. Bro. Hugh being an 87yr old WW2 veteran made light of saying '' I had to go through much worse than that when I served with the Durham Light Infantry'', Bro. Hugh was quickly dried off, given dry clothes and sent hame early for a bath by the boys at the fishery. The apree fishing started early but Bro. David Murray and yours truly was in shock by Bro. Hugh's early bath. Lunch saw Bro. 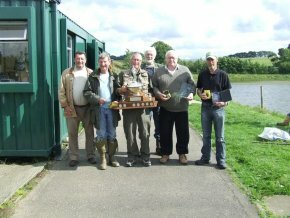 Billy Boe, David Kirk, Robert McCrae, Sanny Gilmore and George Hyslop join in the apree fishing. Bro. John Hodge who had 4 fish by lunch time said he had dropped a couple and went to do battle for a 5th but alas he never did catch the elusive 5th fish much to the amusement of the apree fishers who cheered as he went on to lose another 6 fish as they came to the net. Our sincere thanks go to all at the Burns Fishery for the lunch and the assistance rendered to Bro. Hugh Paton, our Provincial Grand Master Bro. Archie Chalmers who presented the prizes and Bro. Joseph Baird PM 127 who sponsored the prizes. 1st Bait - Bro. Joe Pettigrew No 22 5 fish 10lbs 7 1/2ozs. Big Thanks to all who attended for making it such a great day. 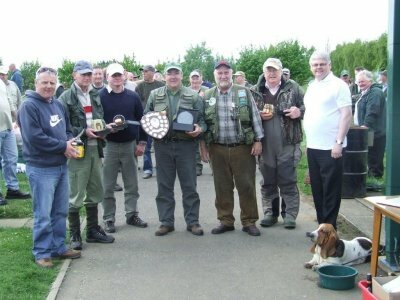 On 17 May 2009 PGLA hosted the fly fishing competition. 42 Brethren and friends fished and 63 fish were caught totaling 150lbs and 2oz. The weather was adverse to say the least with a strong southerly wind blowing close to gale force which made fishing a bit tricky. Our thanks go to RWPGM Bro. Archie Chalmers who came along at the start of the competition and took some action shots. Thanks also go to the lads at Burns Fishery for their Hospitality. The soup and crusty bread was very well received. The competition raised £282.10. 1st: Bro William Beattie St Thomas No.433 4 fish 9lbs-13oz. 2nd: Bro John Hodge PM St John No.11 3 fish 9lbs-1oz. 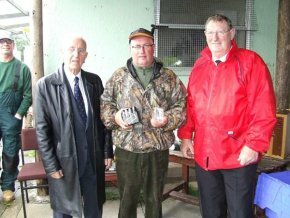 3rd: Bro Craig McGrugan St James No.125 4 fish 8lbs-13oz. Heaviest fish: Bro. John Hodge St John No.11 4lbs-14oz. Best Visitor: Mr Alex Bowler 5 fish 12lbs-13oz. 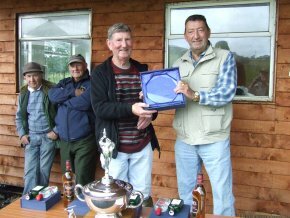 On Sunday 21 Sep 08, the Ayrshire Brethren travelled to Jericho Loch at Locharbriggs to fish the inter Provincial Fly Fishing Competition. Expectations were high as we tackled up and awaited instructions from organiser Bro Charlie Auldman. We trundled off to our various pegs and battle began at 10am. Pegs 3-4 or beats as they call them in Dumfries did not fish well in the morning, pegs 1-2 on right hand side seemed to be fishing better. Lunch 12.30-1.00pm, the usual comments, it is too bright and there was too much algae, their rising to far oot, ah canny cast fur the trees,ah huvnae had nothing but dead water in front of me all morning. However, with spirits high we commenced our second assault upon the fish at Jericho, alas our endeavours were in vain although we had no blanks, the weight was sad and doleful. Ayrshire weighed in 37lbs 14oz, Dumfries 40lbs 2oz and Galloway 32lbs. 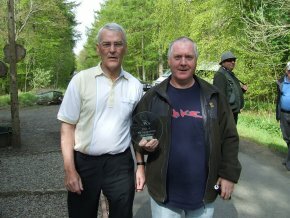 Heaviest fish and winner of the sweep was Bro John Anderson No 11 Ayrshire and 4th overall Bro John Hodge PM No 11. Our sincere thanks to PGM Dumfries Bro John O Green and his good lady for presenting the prizes and to Bro Charlie Auldman and the lads at Jericho for organizing the competition. 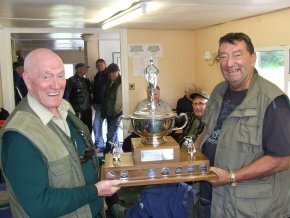 The Open Pairs fishing competition was held on 7 September 2008 at Boreland Fishery, Cumnock. 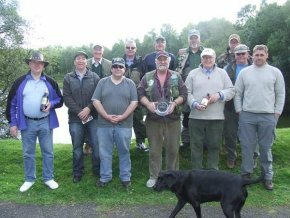 Thirty four brethren and friends fished for the honours. The weather was overcast with a cold north wind, which seemed to put the fish down a bit, sink tips and intermediate lines were to be the order of the day with the fly fishers. The bait fishers were taking fish on the bottom and on the bubble floats; Bro. David Kirk MK0 almost lost his record of fastest bag up time by Bro. Richard Allan on the bait caught five fish in the first hour. This is only Bro Richard’s second time out fishing, beginners luck? The fish were coming slowly on the fly pond, however this was not so for Bro. Bill Boe on his first peg he landed 3 fish one of which was a cracking 9lbs 14½ oz. When word spread of Bill’s big fish, it put pressure on the rest of us, especially Bill’s partner Bro. John Porter who was struggling but patience and perseverance won the day with some friendly encouragement he caught four fish. Our sincere thanks to Bro. Robert Howatson for sponsoring the competition, to Bro. 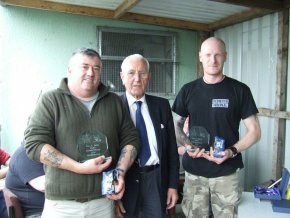 Neville Clarke and Bro William Steele for helping give out the prizes, to the brethren who brought raffle prizes and to the boys at Borland fishery who helped out on the day. 118 fish caught for 369lbs 7½oz. 1st – Bro. Bill Boe No.290 9fish 27lbs 13½ oz, Bro. John Porter PM No.556. 2nd – Bro. 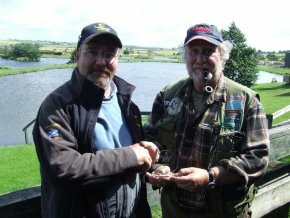 Alan Fowler MK0 10fish 24lbs 7oz, Bro Richard Allan MK0 3rd – Bro. Brian Bell No.505 10fish 23lbs 7½oz, Mr Colin Gardner. Heaviest fish – Bro. Bill Boe 9lbs 14oz. 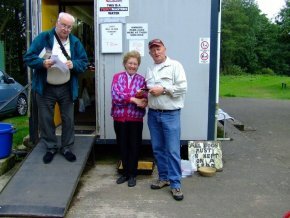 Sunday July 13 2008, we held the Auld Codgers Fly or Bait Competition at Boreland Fishery, Cumnock. 26 brethren and friends attended and caught 79 fish. The weather was kind bur for some the fish did not cooperate so the "Apri" fishing started early. 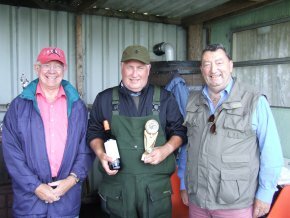 Brother David Kirk of The Mother Lodge was once again the first to bag up, a clear winner of the "Apri" fishing with Brother David Murray of St John No.22 a close second. The fishy stories started early which Brother David Kirk won with his old friend fishing with "Horse Hair Casts" -- no Contest. 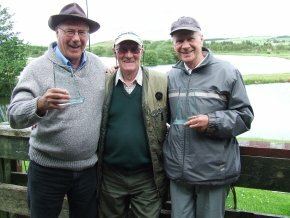 Some of our older brethren, and active fisherman, competed -- Brother Hugh Paton, Past PGSW, a sprightly 86 years young and last year's winner of the Bait, Brother David McKie of Lodge St James No.135, a very active 80 year old Fly Fisher. 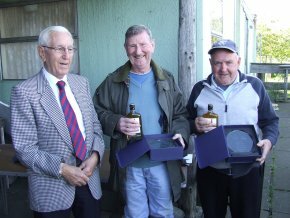 Our thanks to our PGM, Brother Archie Chalmers for attending and presenting the Trophies; Brother James Smillie for sponsoring the trophies; Brother Joe Timmins and Brother Bill Dykes for the rolls and sausage and Big Willie Menzies for the cooking. 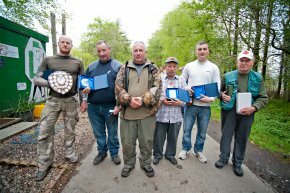 Our thanks also to the boys of Boreland Fishery and especially the brethren for their support. The winners were 1st (Fly) Bro. 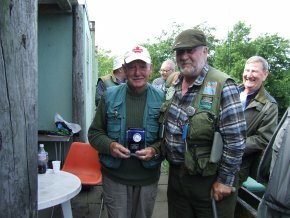 John Brown RWM of Lodge St John No.22 with 5 fish weighing 13lbs 12 oz. 1st (Bait) Bro. Tom Stewart of Lodge Mother Kilwinning with 5 fish weighing 14 lbs. 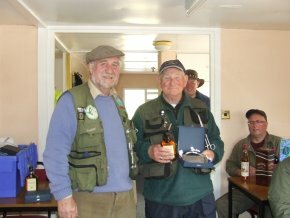 The Auld Codgers Day is a fun day and all who attended certainly enjoyed their day of fellowship and fishing. 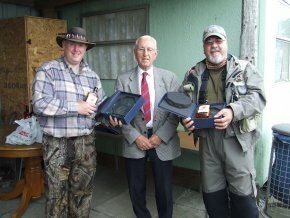 On Sunday 18 May 2008 the Fly Fishing Competition of the Provincial Grand Lodge of Ayrshire was held at Boreland Fishery, Cumnock. This is a superb venue and enjoyed by the members of the fishing fraternity. Sunday was a glorious day, ideal for fishing. 37 rods were in play and at the end of the competition a total of 125 fish were weighed in. Total weight being 331lbs. 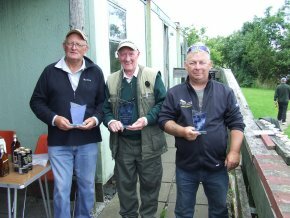 The Winners were (1) Heaviest Bag - Brother William Beattie, Lodge St Thomas No.433, with five fish weighing 15lbs 3 ounces; (2) Brother A. McCrea, Lodge Mother Kilwinning, with five fish weighing 14lbs 2.5 ounces; (3) Brother Billy Boe, Lodge Dalry Blair No.290 also with five fish weighing 14lbs 1 ounce. 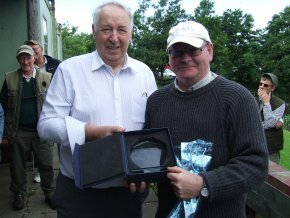 The Single Heaviest Fish Prize went to Brother Jim Dempster, Lodge Irvine St Andrew No.149, weighing 4lb 1 ounce. 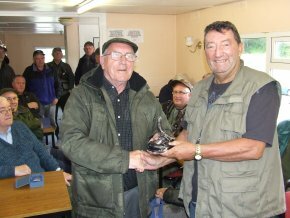 Prize for Best Visitor was won by Mr John Brown of Ayr with five fish weighing 12lbs 8 ounces. The event was once again arranged and organised by Brother William Dykes who thanked everyone who had taken part. It had been a very successful day, for sport and for friendship. He thanked the two Sponsors of the day, Brother Jim Smillie PM Lodge Coila St Andrew No. 1334 for the Trophies and Brother Joe Baird PM Lodge Thistle No.127 for the Liquid Prizes that went with the Trophies. The RWPGM presented the Prizes and thanked everyone for their support towards the PGL of Ayrshire. The event raised £284 for PGL funds. Many thanks to all who took part and assisted in raising this tremendous amount. 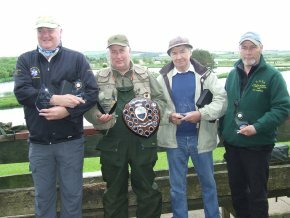 On a cold wet and rainy 16 of Sept at Boreland fishery Cumnock, the Ayrshire Brethren took on the Brethren of Dumfries and Galloway Province and won the inter Provincial Fly Fishing competition. 1st Bro Alex McRae Mother Kilwinning No 0, 2nd Bro Roddy Dalgleish St Barnabas No 230, 3rd Bro David Kirk WSW Mother Kilwinning No 0. The heaviest fish went to Bro Eddy Cowan at 6Lbs 2 Oz. 24 Brethren fished and 73 fish were taken. 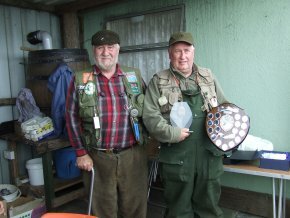 Our sincere thanks to those die hard brethren who braved the elements to support this competition and to the lads at Boreland Fishery for their hospitality. We went home tired and wet but not hungry, Big Willie's burgers went down a treat. 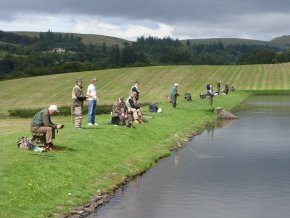 The Open Pairs Fly or Bait fishing was held Boreland fishery Cumnock on 2 Sep 2007. 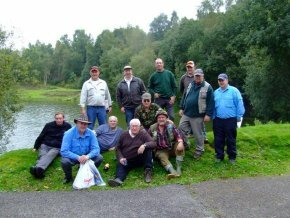 42 brethren and friends fished and landed 132 fish. The day was overcast with some light rain, however the fish were on the take. This made a big difference as they attacked the water with zeal and anticipation as nine anglers weighed in with full bags. 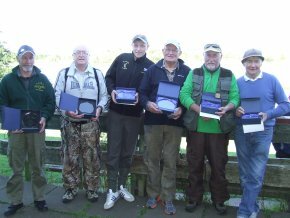 1st Bro John Hodge PM St John Maybole No.11and Bro Jim McPheator PM St David Mauchline No.133 with 10 fish for 23lbs15oz, 2nd Bro John Brown RWM St John Kilmarnock No.22 and Bro Ray Parker St James Tarbolton No.135 with 10 fish for 22lbs 15oz, 3rd Bro David Penny Royal Arch West Kilbride No.314 and Mr Bill Muir with 10 fish for 22lbs 1oz The heaviest fish went to Bro Jim McPheator PM St David Mauchline No.133 at 3lbs 15oz Our thanks to the sponsor Bro Bobby Howatson of St James Newton-upon-Ayr No.125 and Bro John H Ralston IPPG Master who attended and presented the prizes. The competition raised £332 for charity. 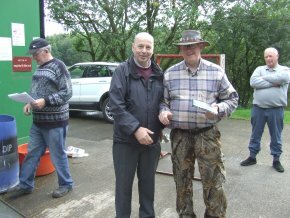 The Auld Codgers Fun Day was held at Spring Water Fishery on 15 July. 19 Brethren fished and 33 fish were taken. The weather was kind with a light wind and slight cloud cover. 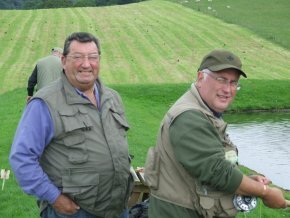 Many of the brethren took up fly fishing which we do with great gusto. 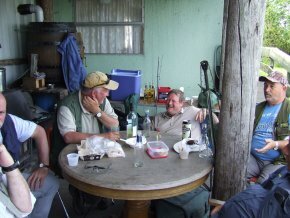 Many fish were caught in the fishing lodge that day and the banter was to a very high standard. 1st on Bait was Bro Hugh Paton PM PPGSW, St Clement Kilmarnock No 202. 1st on Fly was Bro Joe Pettigrew, St John Kilmarnock No 22.Thanks to the sponsors Bro Roddy McLean PM Thistle Stewarton No 127 and Bro Bill Dykes Coila St Andrew No 1334. The Fly competition was held at Craufurland on 20 May2007. 40 Brethren fished and 58 fish were caught. 1st was Bro David Strachan PM PPGSW Burns St Mary Hurlford No 505, 2nd Bro Bill Boe Dalry Blair No 290 3rd Bro Scot Crawford Beith St Johns No 157. Heaviest fish went to Bro William Cuthbert St John Maybole No 11. A great response from the Brethren which raised £373 for charity. Many thanks to our sponsors. The Mother Lodge Kilwinning No 0 and Bro. Joe Baird PM Thistle Stewarton No 127. 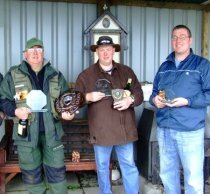 The winners of the open fly or bait competition held at Springwater fishery on 5 August 2007. 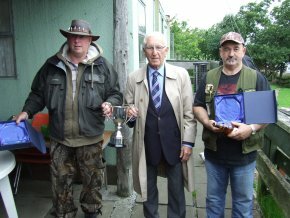 33 Brethren fished the competition and 33 fish were taken. 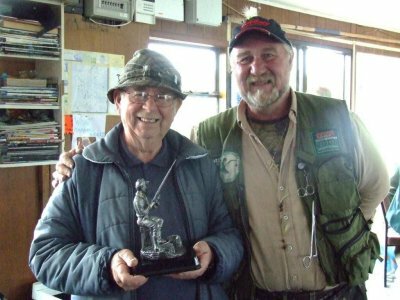 The weather was terrible with persistent heavy rain which resulted in poor catches for all, however the diehards fished through to take the honours. 1st Bro Tom Fulton St James Kilwinning Tarbolton No 135. 2nd Bro Brian Bell Burns St Mary Hurlford No 505. 3rd Bro David Kirk Mother Kilwinning No 0. Heaviest fish Bro David Kirk Mother Kilwinning No 0. Our sincere thanks must go to the Provincial Grand Lodge of Kilwinning for their sponsorship and to their Provincial Grand Master Bro David Wilson who braved the bad weather and presented the prizes along with IPPG Master Bro John H. Ralston. The competition raised the sum of £244.78.